Budhia Singh- Born to Run's trailer was so brilliant that I do not think anyone would not have wanted to watch it. And as it is inspired from true events, it became a lot more excited for someone like me who loves watching such movies. It’s the story about 5 years old boy who completes running 65 kms in 7 hours approximately which results in vindication of his name in Limca’s book of record. Later on, government puts a ban on him for running in any kind of marathon and his coach is murdered. Now much of this is fiction and how much is fact is questionable but movie keeps giving you thrill and goosebumps. Director have kept the movie very paced, fast and to-the-point which does not let you get bored otherwise it could have become very plain as movie does not have much in its plot except the base story. Right from the 1st scene to the end, you are hooked to the screen which is enough to determine that the movie is well-made and entertains the audience. The dialogues are powerful. It was also necessary as for a strong story, one needs strong dialogue to project the conversations. 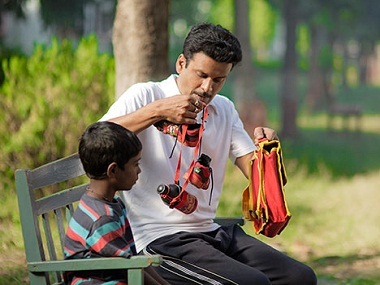 Talking about the performances, Manoj Bajpayee has shown a strong commitment towards playing this character. He looks so believable that you can’t take eyes off him. The dreams and hope that he shows in his eyes for the boy to qualify in 2016 Olympics is beyond acting. He has just imbibed the whole story in himself. The boy who plays Budhia Singh i.e. Mayur Patole also justifies his role very well. He actually looks similar to the real Budhia. The way he shows commitment on his face to run until asked to stop is also clap-worthy. Overall, this is a movie to be watched without giving 2nd thought. I give it 3.5* out of 5.